Welcome to Kaimana at Pohailani Maui! Enjoy amazing ocean views, sunsets, wildlife watching, and neighbor island views of Molokai and Lanai from this well provisioned condo located on West Maui. We are located so close to the ocean you could throw a stone into the waves. So close, it is as if you are on a boat! Take advantage of Maui living on your private lanai (balcony), as well as spectacular ocean views extending down the coast. The first Humpback Whales are here now too! The main living area has full ocean views and is very comfortable. Accented with tropical hardwoods, this studio has a comfortable Queen sized bed and Queen sized sofa sleeper. A beautiful lanai allows you to expand the living area outdoors for full indoor/outdoor living in your private oasis. Dine in with the best ocean view. Whale watch, gaze out over the sea, or just listen to the waves. Relax and enjoy paradise. Peace and tranquility define this cozy condo by the sea. Kaimana is fully furnished and has everything you need to enjoy gracious island living, just bring your swimsuit and toothbrush! We have all the linens, towels, beach equipment (boogie boards, beach chairs, beach umbrella) and kitchen gadgets you may want. The condo is stocked with quality appointments. The sheets are 800 thread count, the towels are Ralph Lauren, and the bed is a plush Simmons BeautyRest. This condo is set up as your own home. Complete with a full kitchen and bathroom with a tub and shower, Kaimana has all the touches of home for you to enjoy your stay after sightseeing around Maui. Kahana is located North of historic Lahaina town, between Kaanapali and Kapalua resorts, and is a half mile from a grocery store, shops, and a farmers market. World class resorts, famous beaches, championship golf courses, and even ferry rides to Lanai and Molokai are within 15 minutes driving time or less. Pohailani sits on 8 acres of tropical landscaping. We invite you to enjoy our piece of paradise. The ocean view and the gentle trade wind breeze. Beach is right next to the property. 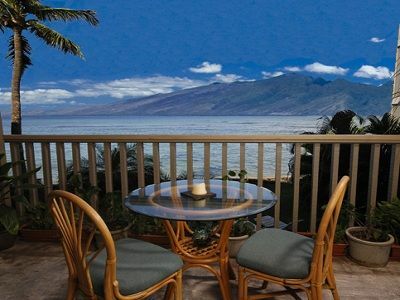 Amazing Ocean Views with Sunsets, Molokai and Lanai as backdrops. Early morning rainbows over the ocean are frequent. Steps from the ocean. So close to the ocean, it is as if you are on a boat. New Air Conditioning unit recently installed. High quality Egyptian cotton linens, extras on hand. Full Sized Appliances, everything you could want in your kitchen. High Definition Flat Screen TV Panasonic 32' screen. We were here for 6 nights and had a wonderful experience. We ate breakfast looking out at the water every morning (and several lunches and dinners too). On our last morning we ate breakfast and watched whales. I snorkeled straight out from the condo three times. You have to swim out a pretty good distance (all over shallow water) to get to clearer water with lots of fish. Snorkeling at mile marker 14 south of Lahaina is better but I enjoyed it here too while my wife relaxed in the condo. We watched turtles right off the sea wall several times. A great place to stay, I’d recommend it and would stay here again. We really loved the studio! The view was fantastic! Cute, clean and comfortable. Melissa responded quickly to questions. Really appreciated the provided coffee and other seasonings. We would have loved to been able to stay longer. We watched whales and spinner dolphins in the morning from the lanai and sunsets in the evening. The binoculars in the unit were really good. This place is awesome for the price. I loved the location. The view is incredible and does not get much better. We had a great time during our stay and never had any issues. Melissa always responded very quickly and made us comfortable with everything, Not the most modern of places but still quaint and clean. Overall we loved it and would stay here again! Location right on waterfront couldn’t have been better. As advertised loved it. Wonderful studio condo. Everything you could need including binoculars to see whale spouts off the lanai. Quiet and comfortable. Loved my stay here! Kahana is located halfway between Kaanapali and Kapalua. There is nearby Golf courses in Kapalua and Kaanapali, including Kapalua Golf Academy. There are many hiking and walking trails in the area. There are several restaurants, banks, shops, and a small general store within walking distance of the condo, including Maui Brewing Company, Dollie's, and a Sushi restaurant. There are several great beaches in the neighborhood, and several great snorkeling spots in the area. Honolua Bay is just north, and Ironwoods horseback riding is a 5 minute drive. Lahaina Harbor and Kaanapali Beach are close by and have boats that go sailing, snorkeling, whale watching (in season), and have dinner cruises. So much more...A guide in the condo will give you more info. • Rates are subject to change until reservation is confirmed with payment of deposit. • Cancellation policy: 1. No refunds prior to thirty days before arrival unless we can rebook for the full amount. 2. There is a $50. cancellation fee charged for cancellations less than 60 days prior to arrival date.